Adults and kids alike will be lining up to play this game at your hoilday party! Whenever we get together for Sunday dinners, we usually end up laughing hysterically as we reminisce about past holidays and other “funny family moments”. Honestly, there’s nothing that makes me laugh harder than listening to “family stories” as told by my kids, or siblings, or nephews, etc. Eventually we have to force ourselves to stop, or we’ll go on all night! One of our recent reflections on “funny family moments” from days gone by was about one of our favorite holiday traditions… The Flour Game! We played this game quite a bit at our family parties when my kids were little, and it always GUARANTEED lots of laughter and fun! I’m sharing it with you today so that you can include it in your own holiday festivities this year, if you want! The only thing you might have to go to the store to buy is a package of candy, but other that than, you probably already have everything you need to play! To play the game (according to our family’s version), you fill a teacup or measuring cup with flour, and packing it down firmly. Flip it over onto a plate, then place a Lifesaver candy on the top of the packed flour mound. Each person takes a turn cutting the flour with a knife. Whoever makes the Lifesaver FALL has to fish it our with their mouth! No hands allowed! As you can imagine, hilarity often ensued! As kids I remember we couldn’t WAIT to play The Flour Game at our family parties! It is definitely one of our most treasured holiday traditions. We decided to “stage” a game so we could take some photos for this post, but even a “fake game” had my kids cracking up! 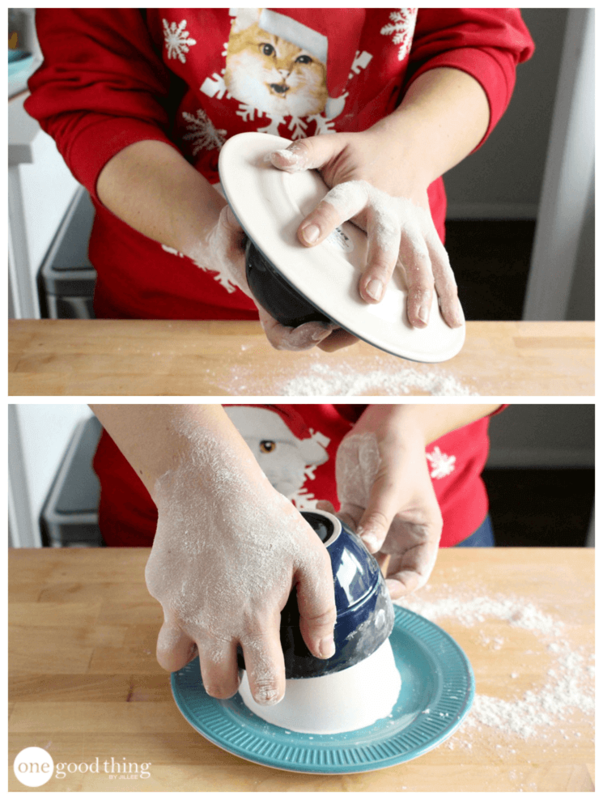 So why not implement a new holiday tradition this year and give The Flour Game a try?? Looks like a ton of fun. The flour game sounds great, I will definitely be trying this out soon. I think I might try this again with powdered sugar. My 6 yr. old grandson was not happy to have a mouthful and face full of flour. He got a little choked on it, so I think it could be a health hazard. This looks….. AMAZING! Thank you for the tips about the flour. I don’t want my kids getting sick. Do you have any suggestions instead of lifesavers? My kids don’t like them or any candy. What could I use instead? Sounds fun, however, be careful not to inhale the flour if you are laughing. Can be quite dangerous. I loved the game, but the warning about the flour had me feeling a little deflated. Using a substitute might help, though! I love the cat/snowflake sweatshirt ! This looks like so much fun, but I have to comment. Why or why does it happen that every single time someone posts a new idea or thought, there has to be a person to come along and warn how this innocent game might kill you. Do you troll the internet LOOKING for posts to pee on? Maybe they care about people? I personally like to know about these kinds of things so I can make my own informed decisions. Always love reading your ideas , thank you for sharing so many different ideas. I’m guessing the point is to eat as little raw flour as possible! However you could always substitute powdered sugar. Or maybe cornstarch.